Venturing out from Sydney has its rewards of lifelong memories with a unique Australian flavour. See also Australia Travel Information and Australia Places of Interest. New South Wales, with Sydney as its capital is both energetic and cosmopolitan. Host to the Sydney 2000 Olympic Games it had metamorphosed into a true international city after World War II. Today, Sydney Harbour is still beautiful, the beaches in Sydney are many and the city itself, is surrounded by vast national parks that are easily accessible. The rest of the state of New South Wales has gorgeous Coastal regions, country lifestyle in the center, surreal desert in the far West and winter snow skiing in the Snowy Mountains. The Hunter Valley Region, only 1.5 hours drive from Sydney has great wines and gourmet experiences. 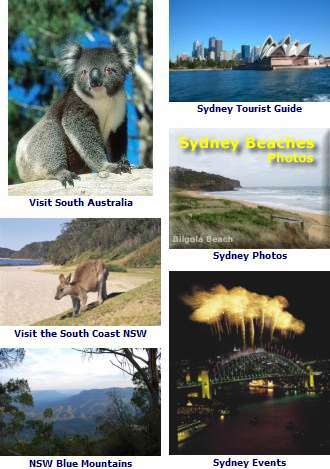 About places to Visit in New South Wales NSW Tourist Guide. Queensland is referred to as the Sunshine State for its sunny days all year. Brisbane Australia, its capital, has grown into a cosmopolitan city with lots of charm. There you will find some fabulous dining, excellent chances for shopping, theatre and the arts, with live entertainment throughout the year. Close to Brisbane is the Gold Coast and Surfers Paradise, the center of beach life set at a high pace while to the north, is the Sunshine Coast, with scenic beaches in sub tropical settings. Adelaide in South Australia is often described as a city within a park. Carefully planned from the beginning in 1837 as a city of broad streets, logically laid out. There was ample space left by the planner, Colonel William Light for a green setting of surrounding parklands with the beautiful Mount Lofty Ranges in the background. More about Adelaide South Australia. Great wines are grown in South Australia. Places to visit include the great wine regions of Adelaide Hills, Barossa, Clare Valley and the Limestone Coast - Coonawarra region. About South Australia South Australia Tourist Information. Victoria has Melbourne Australia as its capital, with festivals and events the year round that celebrate the arts, sports and culture. Recommended for gourmet lovers, Melbourne’s modern multi-cultural background provide for sumpteous dining experiences, with entertainment and nightlife to match. Victoria is known as the ‘Garden State’ with green hills and valleys covering much of the state. There are Goldfields to explore, even chances to find Opal in the desert regions. Amongst places to visit, The Great Ocean Road is a delight to travel, with small seaside hamlets and villages tucked between the headlands to rest and play at. Explore the untouched wilderness of Otways Forest, see the Twelve Apostles and visit beaches and other national parks along the route. See maps, photos and more about Victoria Australia Victoria Tourist Guide. Tasmania Australia - a rugged wilderness wonderland set against the cooler clime of Australia’s South. Tasmania and Tasmanians have put considerable resources and time into preserving much of their beautiful state while inviting your exploration. About Tasmania Australia Tasmania Tourist Guide and Hobart Australia. The Northern Territory extends all the way from central Australia to the Top End. Home to the Kimberleys, Kakadu, deserts and spectacular rainforests. Darwin, originally very isolated from the rest of Australia has come into its own with its multicultural lifestyle, close to Indonesia and the rest of Southern Asia. If you can make it to the center of Australia, one of the most rewarding places to visit is Uluru, formerly Ayers Rock. About The Northern Territory Australia The Northern Territory, with Map - Darwin Australia. Western Australia is big, really big yet sparsely populated. Perth, its capital is growing in both size and stature in Australia’s economy and importance, yet many say it is still Australia’s most beautiful city. The rest of the state has much to offer the visitor. Go pearling in Broome and explore jungles in the north, fossick for gems and gold in the eastern deserts, or explore the gourmet delights in the south west. Its many untouched beaches and wilderness areas are alone worth the visit to Western Australia. See more About Western Australia Western Australia Tourist Guide - Perth Australia. Air travel is the most popular way to visit Australia, but also interstate, allowing you to see more of this continent. More about Australia Air Travel. More Australia Places Australia Places of Interest.